A free iPhone and iPad App - providing access to key economic and social indicators - will put official Aussie statistics at a Not for Profit’s fingertips. A free iPhone and iPad App – providing access to key economic and social indicators – will put official Aussie statistics at a Not for Profit’s fingertips. The app by the Australian Bureau of Statistics, uses data collected in the 2011 Census and provides access to fascinating facts related to people, families and dwellings. 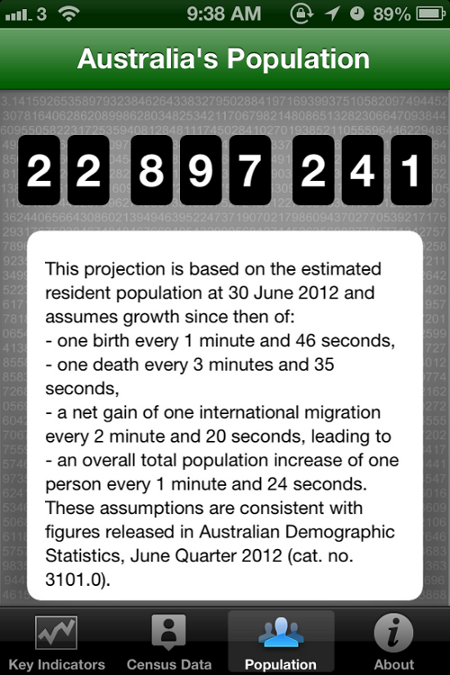 There is also a population clock which displays the current population projection for Australia and is updated quarterly. In addition, the ABS says the app links seamlessly with its social media sites, the official web site and ABS BetaWorks. One of the ideas behind the app was to get the ABS statistics out to everyday users,” according to an ABS spokesperson. The app is available at the Apple App Store.